BUFFALO, N.Y. (AP) -- So long as goalie Ondrej Pavelec stays on top of his game, Winnipeg Jets coach Claude Noel doesn't have to worry much about his team's struggling offense. Pavelec did his part on Tuesday night, making 29 saves to help the Jets snap a three-game skid with a 2-1 win over the unraveling Buffalo Sabres. And that made it easier for Noel to assess his offense extending its string to seven games since scoring three goals in regulation. Pavelec was particularly sharp in stopping the final 11 shots he faced after Jason Pominville scored to cut the Jets' lead to 2-1 in the final minute of the second period. Andrew Ladd's goal that made it 2-0 early in the second stood up as the winner, and Bryan Little also scored for Winnipeg. The Jets won for the third time in 10 games while opening a season-high five-game road swing. ''After three straight losses, we wanted to get a good feeling back in the room,'' Ladd said. Demoralization and frustration continues to creep into the Sabres' locker room, which remained closed until 15 minutes after the players were booed off the ice. The boos began at end of the first period and grew louder in the second when Buffalo experienced difficulty getting out of its zone. The Sabres then earned a Bronx cheer when they finally crossed the Jets blue line. Buffalo dropped to 4-10-1 since getting off to a 2-0 start to the season and has dropped consecutive home games for the first time since last February. The Sabres continue to commit familiar mistakes. They gave up another early goal, with Little scoring a minute in on the Jets' first shot on goal. That was reminiscent of how Boston built a 2-0 lead 87 seconds into a 4-3 win over Buffalo on Sunday. And the Sabres continue to hurt themselves with sloppy giveaways and lethargic play inside their own zone. Little was left standing alone in front, where he was set up by Evander Kane, who outmuscled two Sabres defenders to dig out the puck at the end boards. Nathan Gerbe's giveaway inside his own zone led to Ladd's goal 6 minutes into the second period. Miller was otherwise sharp in finishing with 26 saves, and bailing out his teammates on several defensive miscues. Miller foiled Jim Slater trying to beat him through the legs on a breakaway with 2 minutes left in the opening period. He also made a diving poke check to stop Kane on a partial short-handed breakaway with 20 seconds left in the first period. Pavelec, appearing in his 200th career NHL game, was equally sharp for the Jets. His best save came with just more than 5 minutes left when he kicked out his left pad just in time to stop T.J. Brennan's hard shot from the left circle. Then there was his left pad save in stopping Tyler Ennis from in close with 1:14 remaining. Pavelec also made a sharp glove save to stop Drew Stafford set up alone in the lower left circle with 1:44 left in the first period. NOTES: Sabres D Jordan Leopold became the latest to land in coach Lindy Ruff's doghouse, becoming a healthy scratch for the first time this season. ... Jets penalty killers went 3 for 3 after entering the game having allowed an NHL-worst 15 goals on 44 power-play chances. 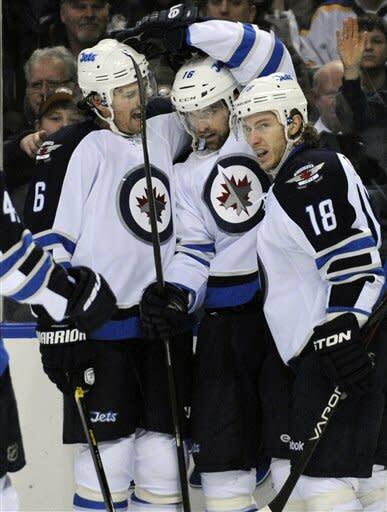 The Jets are 4-0-1 when they don't give up a power-play goal. ... Pominville's goal snapped a six-game point drought that matched the longest of his career, according to STATS. ... The Jets have not lost four in a row in regulation since a four-game skid from Jan. 21-31, 2009, when they were the Atlanta Thrashers.